Chose this as my first trad lead, and my first hand crack in lead. Well not really chose as when we walked past it, someone had left gear up to the beginning of the wide section, and asked if we felt like finishing and retrieving it. I said yes of course, and ended up running it out for 40+ feet, having only one #3 to add to the already placed protection, as a new trad climber. Watch your head when pulling onto the ledge, I nailed my brand new helmet on the down-facing corner, thank god I had that helmet on! If you can bring 3 #3's and #4's, thankfully the 4" part was perfect fists for me, but I have meat mitts. Definitely get on Ahab, hardest 10- I've ever been on, and it ain't over when you get done with the wide part! 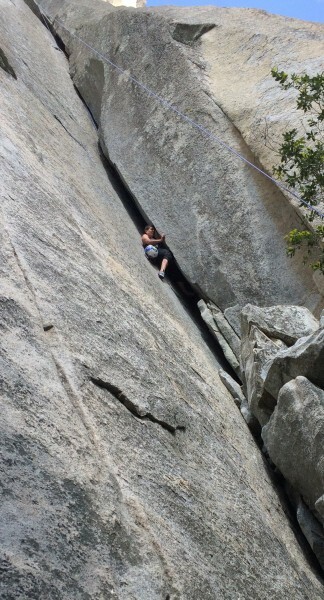 Such an amazing full body work out at El Cap base! Don't forget to TR Ahab 10b OW - ha! bet you can't get any further than the photo! I led this thing back in the late 70's in EB's and a rack that did little to protect me (Jardine hadn't let the populace in on his cams yet). Popped off the start, knocked a tooth out. Undaunted, got back in the thing and sent the crux. Must have taken me an hour to get up the thing. I was so pumped, I had nothing left for the fun looking hands crack that makes up pitch 2. Probably more nerves that it was muscle and sinew. Great climb on all accounts. Outstanding climb! Immaculate rock that will test a good range of your climbing skills. Cruxy finger start, but you can set pro high from the ground. I have large hands and fingers and could only slot my index into the first finger lock - no good without feet. However you can legitimately start on the rock on the left without using the tree by liebacking. After the start, awesome finger locks lead to a mix of hand jamming, liebacking, and bearhugging before the wide part. The wide crack stays at #3 C4 for a while and then very gradually widens to #4. It pinches out for a short section in the middle where you can fit smaller cams, but watch out for the funky inward flare which makes placement tricker. You get a decent rest in a foot pocket on the right before the final and steepest stretch. I ended up climbing the wide part with just one #4 and pushing it up, stupidly ignoring that another one was hanging on my gear loop on the other side (tip: if you have pro with you, use it)... Made for a spicier climb, but I am comfortable on the wide. I have large hands, and most of the wide part was cupped hands for me. The last section widened to perfect fists. For those with smaller hands, you will likely be in off-width land. P1 ends with a cool roof feature that is easier than it looks. P2 is very short but enjoyable hands. Classic, up there with Sacherer in my view! TR'ed this last weekend. Got on the 5.9- way using the tree (too short to reach the good fingerlock straight up). Got spanked on the offwidth, ended up liebacking to finish. Fun stuff! The pin at the start of the fist section is total mank (eyehole cracked and it's moving). However a small stopper fits nicely an inch or so above it. After that just leapfrog 2 3.5 or new style 4s to the top. An orange tcu (long sling) will protect the topout but that's how you get your head stuck. Remind your second to haul up some water. "After the pod I find it easier to climb a bit on the left side of the crack with my left arm pulling on the edge of the crack and my right arm hooked in." Argh! Last weekend I forgot to try it this way, and hand-stacked it again. Oh well, maybe next time. My 4'10" partner had good fun with the start. Fist stacks got her through the top though. TM told me he had done this route 150 times. This route used to be rated 5.9 but was uprated to 10a for the cruxy moves at the start. There are two ways to start. The wide part on top is what spanks most people. If you are short on wide gear, there are a few fixed pins (take sceamers?) on the right during the first 30 feet of fist crack, then, after a wide section, the crack pinches off to #1 or #2 camalot size before getting wide again. You can rest in a pothole pod up and right after a ways before launching into the widest bit. Place a #4 camalot there and you can push it up in front of you if you like. After the pod I find it easier to climb a bit on the left side of the crack with my left arm pulling on the edge of the crack and my right arm hooked in. Being 5'5" with small hands, I loved the finger part (though I imagined a small stepladder would be handy to help reach that first fingerlock) and became slightly flummoxed as the crack widened. As follower, I discovered (after whining about my feet) that climbing the upper crack as a lieback felt much easier and certainly less painful than straight-in, although it would have made it tricky to place pro on lead that way. This is an awesome route. I found the bottom technical 5.10 section harder then the top of the route. I wouldnt consider the top a true offwidth you just have to find the sweet spots where the crack narrows down just enough to jam your fist. Overall it was a great climb that i am definetly going to do again. Killer route but expect to get spanked...the offwidth at the top is certainly the crux. That said there is very little chance that you will fall out of the crack. This is an awesome pitch on which to practice your wide crack skills. You can get by with 2x #3's, 1x 3.5 and 1x #4 if you walk the cams up the crack as you go. the wide crack is really quite long and 4 preferably 6 big (ie #3 or 3.5 Camolots) cams are needed for decent protection. #4 Camolots also work but I'll be damned if the two red Friends I lugged up that climb would fit anywhere! I felt the 10a was far easier than the fist/OW up top. A good climb with lots of wide jamming. One of the first climbs you come to on the approach to the "base routes".